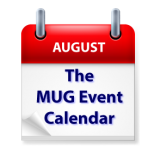 August gets off to a good start on The MUG Event Calendar with a visit by Glenn Fleishman to an Illinois group to discuss Slack, and a presentation on calibrating Photoshop in California. Groups in Connecticut and Missouri will be discussing backups, and a Virginia group will learn more about genealogy. Other topics for the week include TieMachine, iTunes, RansomWare, coding, Graphic Converter and more. appleJAC – "MalWare & RansomWare + Backup"